Defense Commissary Agency Director and CEO Joseph Jeu will retire from government on June 3. 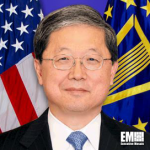 DeCA said Thursday Jeu assumed his current role in January 2011 and has since led transformation efforts, provided strategic direction and oversaw the modernization of supply chain management systems at the agency. Under Jeu’s leadership, DeCA also launched the Enterprise Business Solution initiative that aims to modernize the agency’s legacy business systems. He joined DeCA from the General Services Administration‘s Federal Acquisition Service, where he served as assistant commissioner for general supplies and services. Jeu was appointed to the Senior Executive Service in 2000 and worked as assistant commissioner for transportation and property management at the Federal Supply Service. He also served at the U.S. Marine Corps‘ headquarters where he managed the Marine Corps Commissary System and headed the Marine Corps Services Branch. Jeu started his more than 38-year government career as a commissary officer at the U.S. Army‘s Troop Support Agency.